Chairman of cybersecurity conference tells Arutz Sheva Israel's cyber enemies can come from anywhere - even private individuals. Arutz Sheva spoke with Major Gen. (Ret.) 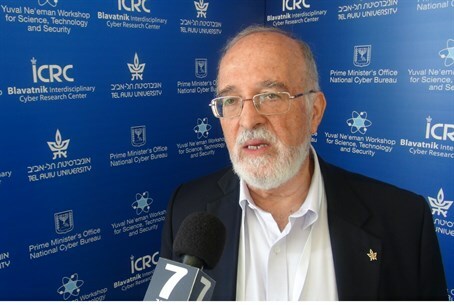 Professor Isaac Ben-Israel on Wednesday, Head of the Blavatnik Interdisciplinary Cyber Research Center (ICRC) and chairman of the Cybersecurity Conference currently being held at Tel Aviv University (TAU). "The global market for cybersecurity products and services is estimated to be around $60 billion USD per year, and Israel's share of the market is close to 10%," he noted. "I don't have to tell you that we are not 10% of anything else in the world." "Israel is considered to be a leading state, second perhaps only to the US," he added, explaining that this is why thousands of people have looked to Israel for their cybersecurity needs. Prof. Ben-Israel stated, as well, that the need for cybersecurity extends far beyond the realm of terror threats. "It's not only terror," he said. "The threat is coming from a long list of adversaries." Among them, he said, are individuals - and even one person "can cause a lot of damage." "Sometimes they are insiders," he noted, adding the example of ex-employees who seek to damage their former businesses. Others, like Anonymous, are loosely organized groups with political agendas. "The most dangerous threat comes from states," he said. "They have enough endurance to develop something sophisticated." Over the past year, great gains were made in cybersecurity - including the IDF reorganizing its own cyberdefense system to make a new, specialized command center to counter cyber threats. And that is the future, he said; not to eschew technological developments in the IDF out of fear, but making them less vulnerable to cyber attacks.